Asceticism: a lifestyle characterized by abstinence from various sorts of worldly pleasures, often with the aim of pursuing religious and spiritual goals. Ashoka: an Indian emperor who ruled almost the entire Indian subcontinent from 269 BCE to 232 BCE. According to traditional accounts, after successful military conquests, Ashoka converted to Buddhism, promoted it across South and Central Asia, and began displaying religious tolerance, supported animal rights, built hospitals, and promoted non-violence. Bodhi tree: a large and very old Sacred Fig tree (Ficus religiosa) located in Bodh Gaya, India, under which Siddhartha Gautama achieved enlightenment, or bodhi. 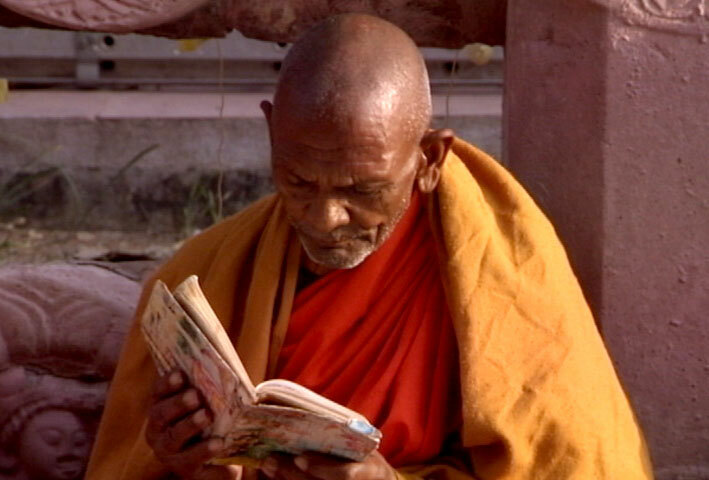 A monk reads a Buddhist prayer book. View Larger Bodhicitta: literally, "mind of enlightenment" or "awakening mind" (citta: mind; bodhi: enlightenment); the vow to strive for Buddhahood both for oneself and for the benefit of all other sentient beings. Bodhisattva: literally, “enlightenment being” or “wisdom being.” A bodhisattva is someone who, motivated by great compassion, vows to attain enlightenment for the benefit of all beings. BongEunSa: a Buddhist temple in Gangnam-gu, Seoul, South Korea, founded in 794 CE. Dathun: Tibetan for "month session"; a one-month group meditation retreat, which is one of the most important training programs in the Shambhala Buddhist tradition. Dogen: (19 January 1200 – 22 September 1253 CE) A Japanese Zen Buddhist teacher who, after studying in China, founded the Soto school of Zen in Japan. Interdependence: a Buddhist teaching on the nature of reality which espouses that everything is dependent on and relational to something else; nothing can exists by itself, without the causes and conditions which enabled it to come into being. Lay: Not an ordained monk or nun. One of the duties of lay followers, as taught by the Buddha, is to look after the needs of the monks and nuns. Lotus: similar to a water lily, Lotuses are aquatic flowers often used as a symbol of purity--the flowers grow out of the depths of muddy lakes and swamps, but always appear clean and pure when they bloom. Mahayana: literally, “Great Vehicle”; one of the two main branches of Buddhism. Mahayana Buddhist schools de-emphasize the goal of individual attainment of nirvana and emphasize the importance of compassion, the possibility of universal liberation from suffering for all beings (hence "great vehicle"), and the ideal of the bodhisattva (someone who, motivated by great compassion, vows to attain enlightenment for the benefit of all beings). Mala: a Buddhist rosary, usually containing 108 beads. Malas are used to keep track of mantra repititions, as mantras are typically repeated hundreds or even thousands of times. The mala allows a meditator to focus on the meaning or sound of the mantra rather than counting its repetitions. Mandala: a spiritual teaching tool and a visual aid to meditation. Buddhist mandalas are complex, highly symbolic, concentric diagrams which often represent an overhead view of the palace where an enlightened being or a deity resides. Mantra: a sacred sound, syllable, or group of words used, through repeated chanting or singing, to focus the mind during meditation. Mantras may sometimes be said to have “magical” properties, such as affording protection and attracting wealth. Mindfulness: a state of purposeful attentiveness which avoids distraction; a calm awareness of one's body functions, feelings, thoughts, or consciousness itself. Nirvana: a peaceful state of mind free from suffering, greed, hatred, or delusion. It is not a place, such as a “Buddhist heaven,” as is commonly thought in the West. Pali Canon: the standard collection of scriptures in the Theravada Buddhist tradition, as preserved in the Pali language. The Pali Canon includes philosophy, metaphysics, rules for monks and nuns, and the discourses of the Buddha. Pali: an ancient South Asian language, and the language of many of the earliest extant Buddhist scriptures. Parinirvana: the death of a person who has attained nirvana and thus will not be reborn again; the final death. Pure Land: a heavenly realm of a Buddha or Bodhisattva. “Pure Land” Buddhist schools emphasize devotion, faith, and conviction; practitioners hope to be reborn in a Buddha’s Pure Land, which will help to further them on the path to Buddhahood. Retreat: temporarily removing oneself from one's usual environment for a period of focused reflection and meditation. Retreats are often conducted at rural or remote locations, either privately or at a retreat center such as a monastery. Roshi: a Japanese honorific title used in Zen Buddhism that literally means "elder master". Samsara: The cycle of birth, death, and rebirth (reincarnation). Samsara can also refer to the suffering that occurs in our everyday life. Sangha: “assembly” or “community”—generally refers to all Buddhist monks and nuns. Sutra: a scripture. Many Buddhist sutras are regarded as records of the oral teachings of Gautama Buddha. Tathagatha: the name the Buddha used to refer to himself. Literally, it means both one who has thus gone and one who has thus come. Theravada: literally, “The Teachings of the Elders”; the oldest surviving Buddhist school and one of the two main branches of Buddhism. Theravada Buddhism relies on the earlier Buddhist scriptures and promotes experience and wisdom gained through meditation, critical investigation and reasoning. Vajrayana: a subset of traditions and practices within the larger Mahayana branch of Buddhism. Traditionally, Vajrayana Buddhism is said to have been taught by the Buddha 16 years after his enlightenment, but evidence points to Vajrayana as a development of Indian Buddhism in the 7th century CE, with some influence from Hinduism. Vajrayana Buddhism promotes compassion and the Bodhisattva ideal, emphasizes the importance of a guru, and contains many complex rituals, visualizations, and meditation practices. Xithro: also zhitro or shitro, a Tibetan ritual to attain enlightenment at the time of death. Yana: literally, “vehicle.” Yana refers to a mode or method of spiritual practice in Buddhism, and in particular to divisions of various schools of Buddhism according to their type of practice. Ye-bul: a Korean Buddhist ceremonial service. Yogas: from the Sanskrit yuj, “to yoke”. Yogas are traditional physical and mental disciplines originating in India. There are many, and the term covers more than the physical practices which are familiar in the US. Zen: the Japanese word for a school of Mahayana Buddhism originating in China around the 7th century CE and now found throughout East Asia. Zen emphasizes meditation practice and is often characterized by simplicity and rigor. Zendo: a Zen Buddhist meditation hall, or any place where Zen is practiced.